My mother gave us a Keurig Brewing System for Christmas last year. It is now one of my all time favorite gifts and we use it nearly every day. Since they’re so popular, there are very few “deals” out there. The price remains the same all year. Every once in a while, I see them at Costco at a great price, but they sell out very fast. Here are the stores that will have the Keurig on sale during Black Friday, as well as current pricing at other retailers. As you can see, the Black Friday deals really aren’t deals at all. You don’t have to wait for Friday… you can go to your local Walmart or Target and get them for the Black Friday pricing! **If you count Kohl’s Cash, these are the best prices! Final price: $79.19 plus shipping is free! Final price: $108 plus shipping is free! *You should get $45 in Kohl’s cash back! I’ve been updating this list as more deals come in. Looks like Kohl’s has some great deals right now! Monique Lawless I have a total couponers crush on you!! THANK YOU!! I think the Kohls sale is only going through tomorrow (like Macy’s) and then the prices will do up again. They are only offering ONE on Black Friday at a discount! Like Monique said, sign up online for the discount! That is awesome Bonnie! Best price by $20 so far! Just got my B40 Elite at BB&B last week for $119.99 less 20% coupon = $96!!! I love it. I use it for coffee, hot chocolate and hot apple cider. That is a great price Mike. The only problem, our Costco sells out very quickly. It looks like BB&B have the best prices with the 20% off coupon! They also have the best selection on K-Cups too! I need to try the cider! I noticed Target has the Mr. Coffee by Keurig for $79 and it comes with a 30 dollar gift card. I am looking to see if that is the best offer available for a K-cup coffee brewer. 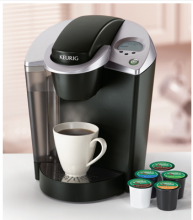 Hi Ruthie, If you aren’t particular about the Keurig maker then the Mr. Coffee by Keurig is a great deal at $79. This is the same price at Amazon.com as well. Do you have a Bed Bath & Beyond by you? If so you can get the Keurig for around the same price if you have the 20% off coupon. the Kohls sales email alert signup tells me it is only 10% off + 5$ off. how do you get 20% off. I think Black Friday is over-rated. The B60 Keurig was on sale with the dual promo codes (NOVSAVINGS and 15PERCENTOFF) to make it like $89 or so and that deal is not being offered on Balck Friday. It was available until recently. That is the best price I have seen, but can’t get at it now. They may have changed it Rose. Kohls is great for discounts but they really fluctuate! You are right, I’ve posted about this a lot lately. Stores love to inflate prices before Black Friday to make it look like there is a great deal. The best price right now is still BB&B. Without coupon, head to Target or Walmart, they have everyday low pricing! Use coupon code CON20HH4 at Kohl’s.com. I got 2 for a total of 185.30 ($93 each) plus Free Shipping plus $45 back in Kohl’s cash. Thanks for the tip on Kohl’s Cash making it the best price! Kohls is the cheapest without kohls cash. My total was 96$ after the code, cheaper then BBB. With 15$ kohls cash plus 10% back on ebates I was able to save big :) Thanx! I’ve been searching for the lowest price on the B60 for about a month. So glad I waiting til today and saw your post. Kohl’s online for $115.39! Cheaper than BB&B, plus I got the free shipping and Kohl’s cash back. Signed up for their emails to try and get another discount off but it said the email could take 7-10 days. Went to Macy’s at midnight last night and the B60 was $131.00! Plus I had a $100 gift card I had saved! $31.00…can’t beat that! Sweet! Newegg has the B60 for $118, no tax or shipping.